LANSING – With tax season entering full swing, Michigan Attorney General today issued an updated consumer alert with tips to avoid the latest tax scams and IRS related scams. 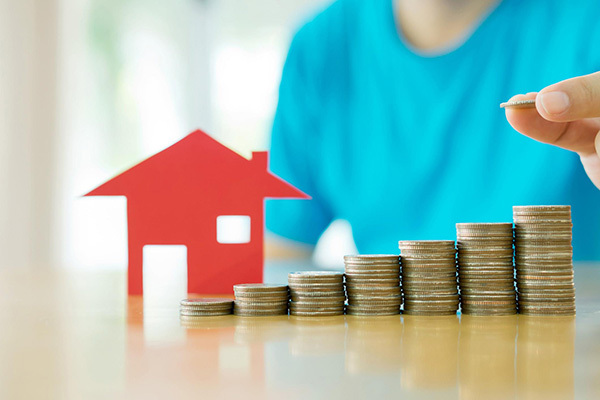 The Attorney General’s Consumer Protection Team often sees an uptick in tax related scams during the early spring months. Schuette noted that the IRS will never contact you asking for personal information by phone or email. Schuette encourages any residents who believe they have received fraudulent calls or emails to contact the IRS directly. *A high pressure call that threatens legal action which can only be avoided by immediate payment. *A caller identifies themselves as an IRS employee and tells the targeted victim that they are eligible for a sizable rebate for filing taxes early if they submit bank account information for direct deposit of the rebate or refund. *A person claiming to be an IRS employee indicates the IRS sent a check that has not been cashed and the IRS needs to verify the individual’s bank account number. *Using the official IRS logo. *Using whole sections of text from the IRS’s website. *Using a fake “from” address that looks similar to the IRS. *Using forms with numbers similar to those the IRS already uses. The IRS will never contact you via email so don’t be fooled. *If you don’t owe taxes, hang up immediately or delete the email without opening it. Report any suspicious solicitation to the Treasury Inspector General for Tax Administration hotline at 800-366-4484. *If you do owe on your taxes, call the IRS at 800-829-1040 if you need federal tax assistance. *Do not click on any links embedded in a suspicious email. *You may forward emails to phishing@irs.gov, the address established by the IRS to receive, track, and shut down these scams. Detailed instructions for how to send the emails are available through the IRS. You may not receive an individual response to your email because of the volume of reports the IRS receives each day. *Report misuse of the IRS name, logo, forms, or other IRS property to the Treasury Inspector General hotline at 800-366-4484. *The only genuine IRS website is www.irs.gov. You should never get to this site using a link embedded into an email. Instead enter the address in your browser. A website link embedded into an email can easily take you to a fake site. The Michigan State Police Lakeview Post would like to remind citizens to never provide personal information via email, telephone, and/or social media. Troopers from the Michigan State Police Lakeview Post have received several calls from citizens advising they have received unsolicited calls from unknown subjects advising citizens that they owe money to the Internal Revenue Service. The unknown callers are advising citizens that they have warrants for their arrest and to meet them at specified locations with money or they will be subject to arrest. The IRS advises if you receive contact of this nature and suspect the caller is not an IRS employee: 1) Ask the caller for their name, badge number, call back number and caller ID if available. 2) Call 1-800-366-4484 to determine if the caller is an IRS employee with legitimate need to contact you. If the person calling you is an IRS employee, call them back. If not, report the incident to the IRS at 1-800-366-4484. Recently a BBB Accounts Payable Staff Member received an email from me, Phil Catlett, CEO of BBB, requesting that she wire money immediately, and to send a reply email to receive further details about where to send the funds. And had she responded to that email it would obviously have never reached me, it’d be headed to some scammer from who knows where. The past couple of years, BBB has been hearing about scammers targeting W-2 employee tax forms. W-2 forms have everything needed to file a fraudulent tax refund request, including the employer name, employer ID, address, taxpayer address, Social Security number and information about 2016 wages and taxes withheld. 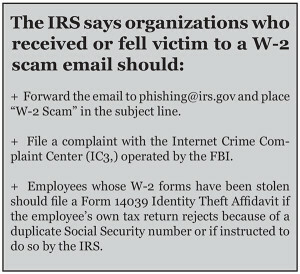 The IRS just issued a warning that scammers are seeking W-2 information in order to file fraudulent tax refund requests. School districts, healthcare organizations, chain restaurants, temporary staffing agencies, tribal organizations and nonprofits are all mentioned in the IRS information as targets. It could happen to any of us, but scammers don’t just stop after they get access to your sensitive information. 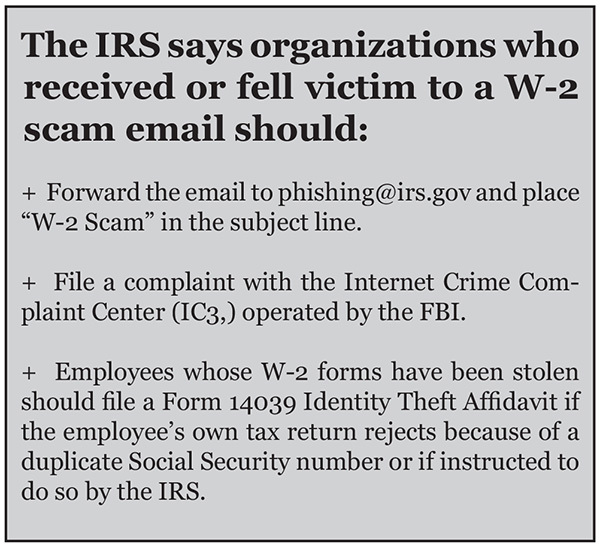 The IRS reports that after they get your personal information, the W-2 scammers send an email to the payroll or comptroller of a company requesting that a wire transfer be made to a certain account. “This is one of the most dangerous email phishing scams we’ve seen in a long time,” said the IRS Commissioner. “Although not tax related, the wire transfer scam is being coupled with the W-2 scam email, and some companies have lost both employees’ W-2s and thousands of dollars.” It is also being reported that scammers are selling 2016 employee W-2 forms that were stolen from victim organizations, peddling individual W-2 tax records for anywhere between $4 and $20 apiece. But the simplest and best way for individuals to avoid becoming a victim of tax refund fraud is to file your taxes before criminals do it. To reduce risk of businesses being hit by these frauds, use two-factor authentication for email, such as telephone calls to verify significant banking transactions. BBB advises that any information about employee activities listed on your websites or in social media can make you more vulnerable as well. 3. Union Benefits May be Taxable. You must include benefits paid to you from regular union dues in your income. Other rules may apply if you contributed to a special union fund and your contributions to the fund are not deductible. In that case, you only include as income any amount that you got that was more than the contributions you made. 5. Visit IRS.gov for Help. 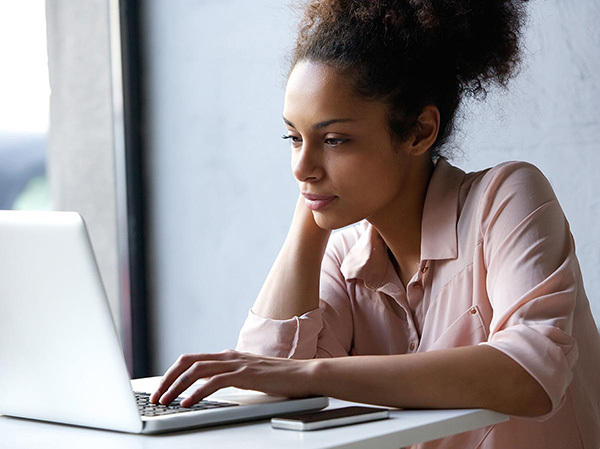 If you’re facing financial difficulties, you should visit the IRS.gov page: “What Ifs” for Struggling Taxpayers. This page explains the tax effect of events such as job loss. For example, if your income decreased, you may be eligible for certain tax credits, like the Earned Income Tax Credit. If you owe federal taxes and can’t pay your bill check the Payments tab on IRS.gov to review your options. 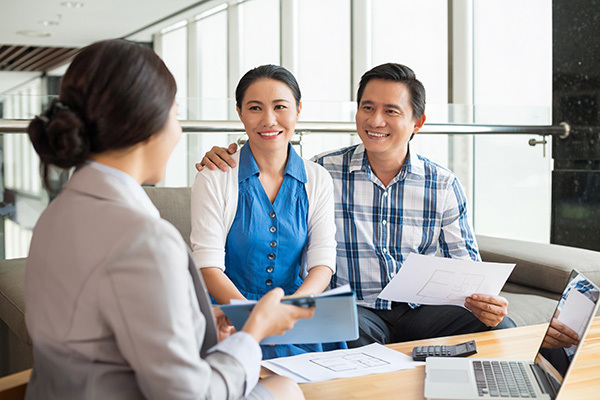 In many cases, the IRS can take steps to help ease your financial burden.